We believe cities are healed relationally. That’s because just like people, over time places begin to bear the mark of the people that love it. The Center has created the perfect platform for sustainable relational transformation and impact to take place. 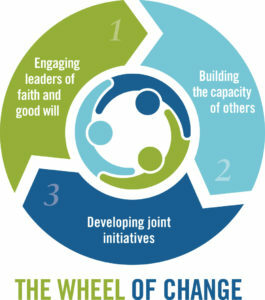 Leadership Foundations has since developed the wheel of change as their key to methodology to permanent city improvements. GRCCT and its’ partners have joined this global movement and methodology that is “fueling” the movement in the City of Grand Rapids. In 2016, GRCCT launched a 6 part training series called, “Loving our City into Greatness:” 10 business leaders, 10 non-profit leaders, and 10 faith leaders have been meeting for 5 hours every quarter to explore the topic of city change. For some this means first addressing the pain the city has caused them. For others this means learning about that pain. Together, we are working through some very intense challenges. However, as we gather these leaders new relationships are being built, capacity is being increased, and new initiatives will being to emerge that heal our city. Read about GRCCT’s collaborative social, environmental, spiritual and economical impact in 2017. GRCCT impacts the quality of life for people in the Grand Rapids community. This is measured by quality of life, economic vitality, and community development. GRCCT deliberately creates workspace environments for people to grow holistically. We believe each individual should be engaged in creating, producing, reflection, and evaluating. GRCCT cares deeply about sustainability and seeks continuous improvement on environmental stewardship. We examine the “footprint” off all our efforts on the planet. GRCCT measures its financial impact to build foundations for future growth through a variety of social enterprises.